Indonesia faces many problems in education. The main problem is raised from the low ability of the headmaster to manage the school. This is related to leadership style. This study aims to explore leadership styles in the field of education and discusses how headmasters should apply leadership styles in schools. Some appropriate leadership styles are applied by the headmaster consisting of (1) managerial leadership, (2) transformational leadership, (3) transactional leadership, (4) instructional leadership and (5) positive leadership. Therefore, the headmaster not only applies a leadership style while managing the school but must be able to combine and contextualize leadership styles based on the need to obtain school goals. Abbas, S. (2014). Manajemen Perguruan Tinggi. Jakarta: Kencana. Bolanle, A. O. (2013) Principals’ Leadership Skills and School Effectiveness: The Case of South Western Nigeria. World Journal of Education. 3 (5), 26-33. Moorosi, P. & Bantwini, B. D. (2016). School District Leadership Styles and School Improvement: Evidence from Selected School Principals in the Eastern Cape Province. South African Journal of Education. 36(4), 1-9. Boonla, D. & Treputtharat, S. (2014). The Relationship between the Leadership Style and School Effectiveness in School under the office of Secondary Education. Procedia Social and Behavioral Sciences. 112 (2014), 991 – 996. Bush, T. (2008). Leadership and Management Development. London : SAGE Publication Ltd.
Bush, T. (2015). Organisation Theory in Education: How does in inform school leadership? Journal of Organizational Theory in education. 1 (1), 35-47. Bush, T. & Glover, D. (2014). School Leadership models: What we do know? School Leadership & Management. 34 (5), 553-571. Chen, C., Tsai S., Chen, H., & Wu, H. (2016) .The Relationship between the Principal’s Positive Leadership and School Effectiveness-Take School Organizational Culture as The Mediator. European Journal of Psychological Research. 3 (2), 12-23. Giltinane, CL. (2013) . Leadership Style and Theories. Nurshing Standard. 27 (41), 35-39. Hallinger, P., & Murphy, J. (1985). Assessing the Instructional Leadership Behavior of Principals. Elementary School Journal. 86 (2), 217-248. Ng, F.S.D., Nguyen, T. D., Wong, K.S.B., & Choy, K. W. W. (2015). Instructional leadership practices in Singapore. School Leadership & Management. 35 (4), 388-407. Ross, D. J. & Cozzens, J. A. (2016). The Principalship: Essential Core Competencies for Instructional Leadership and Its Impact on School Climate. Journal of Education and Training Studies. 4 (9), 162-176. Sofo, F., Fitzgerald, R., & Jawas, U. (2012). Instructional Leadership in Indonesian School reform: Overcoming the problems to move forwad. School Leadership and Management. 32 (5), 503-522. Northouse, P. G. (2013). Kepemimpinan: Theori dan Praktik (Terjemahan), Jakarta: PT. Indeks. Wiyono, B. B. (2017). The Effect of Self-evaluation on the Principals’ Transformational Leadership, Teachers’ Work Motivation, Teamwork Effectiveness, and School Improvement. International Journal of Leadership in Education, 1-21. Silfianti. (2013). Kontribusi kompetensi manajerial kepala sekolah terhadap motivasi kerja guru SMP Negeri di Kecamatan Padang Timur. 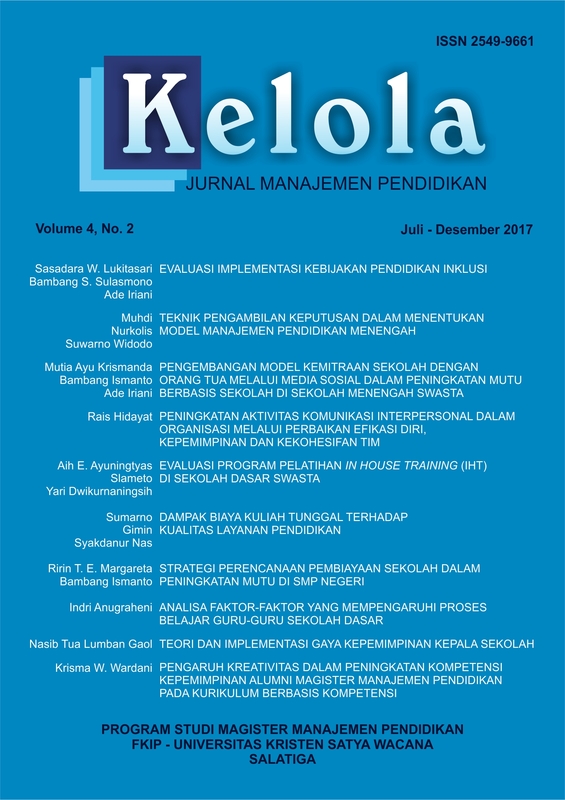 Jurnal Manajemen Administrasi Pendidikan. 1 (1), 220-461. Yang, Y. (2014). Principal’s Transformational Leadership in School Improvement. International Journal of Educational Management, 28 (3), 279-288.